M DelCharco Jr., MD, LLC always appreciates feedback from our valued patients. To date, we're thrilled to have collected 1064 reviews with an average rating of 4.91 out of 5 stars. 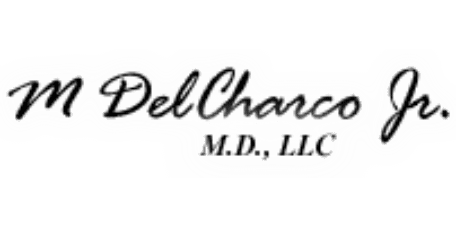 Please read what others are saying about M DelCharco Jr., MD, LLC below, and as always, we would love to collect your feedback. No wait, very timely appointment, professional staff, great experience. I really had a good experience on my surgery, was treated very professionally and the best care,. Thank you from the bottom of my heart. Meghan is very sweet and professional. She listens intently and always ensures all questions are answered throughly. She provides straightforward information and is prompt with seeing her patients for appointments. Would highly recommend! Megan was wonderful and professional. She did a great job of explaining my situation and options. Made my visit very comfortable. As with every visit, my experience was great! This is the only practice in which I have felt comfortable and welcomed. Meghan is great and has awesome bedside manner. Brittnie is always very friendly and willing to help in any way. I've been seeing her for years and feel that this office is the best Ocala has to offer. I found her to be very knowledgeable and through. I would definately see her again. Very knowledgeable, friendly and helpful. Runs on schedule. Thanks! Meghan Mader made my visit very relaxed. I felt very comfortable discussing my issue with her. She was able to help with my problem in a timely manner. Her compassion and concern for my well being has definitely made my decision for choosing this office as the right choice for any issue I may have. Thanks for all your help! I love Dr. Delcharco's office! The facility is beautifully maintained, with a very "at home" and "cozy" feel. Outstanding customer service is a given, due to the professionally prompt and personable nature of their staff. **Meghan Mader, ARNP, MSN, FNP-BC** is by far the BEST, having set the bar for excellence from day one. While maintaining a high level of professionalism, Meghan is also very knowledgeable, having a true understanding of the importance of Dr. to patient communications/interactions, and bedside manners. Cool, calm, and collected - she is very much down to earth, expressing her intelligence with an admirable humility that I find quite refreshing - not to mention she has a sense of fashion that is out of this world! You can tell that everyone within the office truly loves what they do with a passion - and that they're not just there because it's their job. Based off my experiences, I could with confidence, highly recommend their office to all of my family and friends. Meghan has excellent bed-side manner. She is soft spoken and provides a tranquil experience. Her demeanor allows a patient to relax in what is otherwise a stressful situation. Great office, great staff and Dr. Delcharco was so kind and compassionate! So happy with my choice of doctors. Great would explain my expectations from the service received. Meghan was very nice and professional with me. She took the time to explain what she was doing and what it all meant. Meghan was very personable and knowledgable about birth control options.